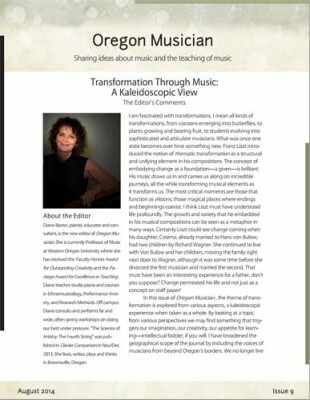 Each issue of Oregon Musician contains articles centered around a theme having to do with music, the teaching of music, or the performance of music. Oregon Musician is produced 2 or 3 times a year. You will need the free Adobe Reader to read Oregon Musician. Contact the Editor Dr. Diane Baxter, NCTM. OMTA does not offer advertising opportunities in the Oregon Musician.